Who doesn't love a good old fashioned shark movie? That is exactly what director, John Stockwell delivers with Dark Tide providing some expected genre thrills alongside some well-shot cinematography and solid performances from stars Halle Berry and Olivier Martinez. After a near fatal encounter with a shark, diver Kate (Halle Berry) opts for a quiet life giving sea life tours. However, the return of her former boyfriend (Olivier Martinez) and a client willing to pay huge sums for the chance to get up close to a great white shark, tempt her to get her diving suit back on. However, when a ferocious storm hits a battle of life and death ensues. John Stockwell is surely the go to guy for ocean-themed films, after all his back-catalogue features the enjoyable Into The Blue and impressive Blue Crush. Showing some similarities with these films, Dark Tide captures the beauty of the ocean but also the darker side of what lurks beneath. This is aided by the stellar cinematography of Jean-François Hensgens who contributes some completely stirring shots to Dark Tide. - showing the near paradise of Capetown, paralleled with the dangers of the sea. Given the experience of Stockwell, it is unfortunate that Amy Sorlie and Ronnie Christensen's screenplay does not bring a huge amount of originality to the shark-film. Despite an exciting opening showing Kate's attack by a shark, the pace slows rapidly and the focus moves onto her broken life as opposed to thrilling shark attacks. When the action does pick up and sharks venture into the Dark Tide's narrative, Stockwell handles it with a sense of urgency and tension making for exciting viewing. Fortunately whilst the sharks are absent there are an array of completely relatable and likeable characters to keep Dark Tide falling completely into the territory of a cheap B-Movie. These performances, most notably Halle Berry and Olivier Martinez's are one of the film's strongest assets. Berry commands the screen as Kate, slowly bringing out her trademark attitude as the character's confidence grows and she eventually gets back in the water. Olivier Martinez brings French cool and sophistication to the role of Kate's ex-boyfriend, making what could have been a forgettable role feel fresh and likeable. 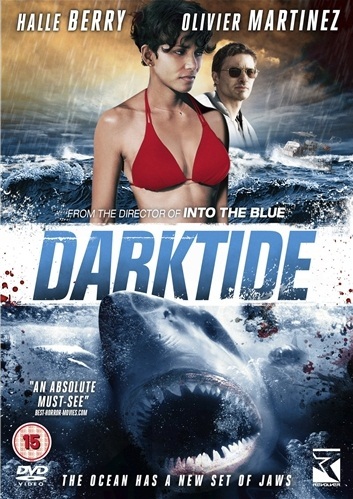 Dark Tide benefits from decent special effects, never looking cheap or inauthentic. A mix of real footage and well-crafted CGI appears to have been used with Stockwell's film having a polished feel. This makes the thrills feel convincing, giving Dark Tide a darkly realistic edge. Whilst unlikely to redefine the genre or become the next Jaws, Dark Tide is a perfectly enjoyable and watchable thriller. Decent character development and solid performances from Berry and Martinez, keep things entertaining, even when the pacing slows.